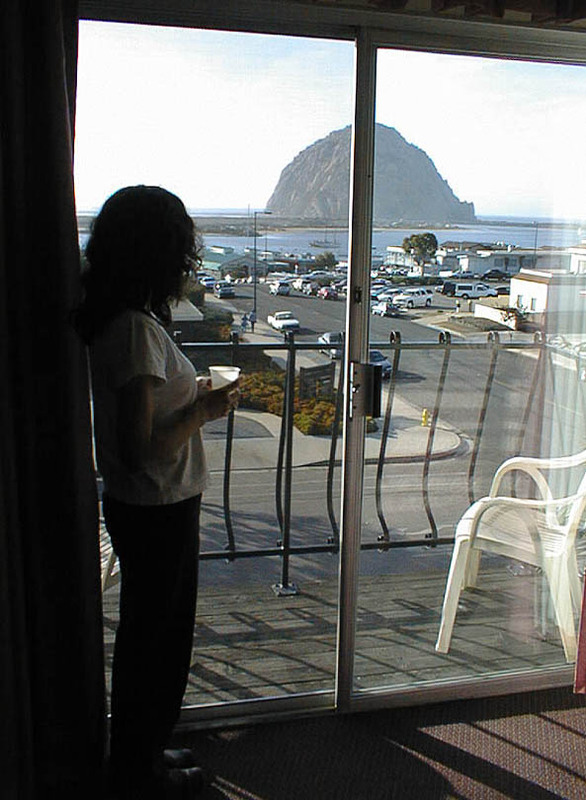 Morro Bay's Morro Rock provided an easy navigational marker for sailors to find its excellent harbor from far out at sea in the days before dead reckoning was supplanted by GPS. The town consists of a rather nondescript grid of streets rising from an intensely touristic shoreside avenue. We took our only boat ride of the trip in the bay--a rather silly heavy boat with lexan ports cut into the side to allow "submarine" viewing of sealife, kelp, etc. The HUGE waves banging over the harbor jetty made any boating excursion into the open ocean inadviseable, so we puttered around the harbor watching sea otters crack open shells while back-floating, and trying to get excited about the chummed fish that congregated by the boat windows. The captain amused himself by dangling a rubber shark from a stick, and zooming it past our window a few times. A couple of the shots show something of the power of the surf outside the harbor.